Featuring four days of dedicated pro audio presentations and events overseen by co-chairs Ben Kok, Mariana Lopez and Enda Bates, the Dublin Convention will include such highlights as a Keynote Speech on "Inclusive Sonic Interactions” by Stefania Serafin, professor in sonic interaction design at Aalborg University; hundreds of Technical Program presentations covering all things audio; and three days of the Professional Audio Showcase sessions and audio hardware and software displays and demonstrations. The papers deadline has passed, but you can still submit an Engineering Brief by January 7. See the Call for Contributions for more information. The AES Inside Track features expert industry curators highlighting a topic of choice, with editorial insight as well as links to related research topics, videos, and more. 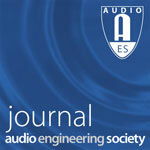 It's available exclusively through the AES Member Portal and is a member benefit, free to all AES members. This month's curator is Francis Rumsey, who introduces some key resources on the topic of listening tests. As Francis explains, "Listening tests allow us to find out how humans judge the results of an audio engineering process or product. In general we audio engineers are more interested in finding out something about the thing that’s being evaluated than we are about the human perceptual process, although we may be interested in that too. It makes us a bit different to hearing psychologists." This month's Spotlight video interview, also hosted by Francis Rumsey, features Natalie Agus of Singapore University of Technology and Design, talking about her October JAES paper on binaural room modeling. The Nominations Committee is soliciting names of voting AES Members to be considered for inclusion in our 2019 ballot for election to the Board of Governors, starting January 2020. The open positions are three Governors-at-Large, plus Regional Vice Presidents for Central Region USA/Canada, Central Region Europe, Southern Europe/Middle East/Africa, Latin American Region, and Asia-Pacific Region. (VPs must be resident in the region they represent.) Two candidates for each position will be selected by the Nominations Committee to appear on the ballot. The Nominations Committee web page has further details regarding eligibility. You will need another voting Member to nominate you if you want to stand yourself. Alternatively, you can nominate another Member provided you have their permission to do so. These positions form a crucial element in the governance of our Society and have never been more important than now, in this rapidly evolving industry. They also help to establish potential candidates for future leadership roles such as President-Elect, and Treasurer and Secretary. The AES website has recently been updated to reinstate the Publications drop-down menu, with easy links to the most commonly needed headings. Further improvements to Publications navigation will follow soon. Did you know that you can find links to Proceedings of AES Conventions and International Conferences on our website? These list the editors (papers chairs) and event chairs, as well as a DOI and ISBN for each event proceedings, along with links to all the papers from each event. You will find information for the recent 144th and 145th Conventions, along with all of the past year's conferences. On the E-Library home page, you will find quick links to 145th Convention papers and e-briefs, with the option to bulk download by topic areas, as well as the top 10 papers from New York and Milan conventions. AES@NAMM events train attendees in a variety of professional audio engineering disciplines. Over 200 sessions offer up-to-the-minute information and career-enhancing inspiration through tutorial sessions, workshops and hands-on training organized into topical Academies. Register now for your AES@NAMM Access Pass! This three-day conference will explore the unique space where interactive technologies and immersive audio meet and aims to exploit the synergies between these fields. The 2019 AES International Conference on Audio Forensics is dedicated to promoting advances in the field through discussion and dissemination of research related to forensic applications of signal processing, speech and acoustic analyses, authentication, and development of methodologies and best practices. A special focus will be made on the techniques and technologies used in the practice of audio forensics. Papers are being accepted from December through to February 1. See the Call for Contributions for more details. The second AES International Conference on Headphone Technology will gather scientists, developers and practitioners who are involved in theory, technical design, application or evaluation of headphone technology. The conference will be an interdisciplinary gathering encouraging fruitful discussions across the headphone, hearing aid and audio delivery industries. Papers are being accepted from December through to February 11. See the Call for Contributions for more details.